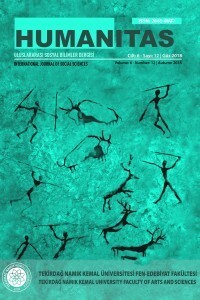 Humanitas - International Journal of Social Sciences is an open-access, double-blind peer-reviewed international electronic journal, published twice a year in Spring and Autumn by the Faculty of Arts and Sciences at Tekirdağ Namık Kemal University. The aim of the journal is to publish research papers in the fields of social and human sciences, which would evaluate contemporary and historical issues and matters of concern with a scientific approach. Humanitas is indexed in MLA, EBSCO, CEOOL, ASOS, TEİ, COPERNICUS. Original and scientific articles are accepted as representing the domains of Psychology, Sociology, Philosophy, History, Geography, Archeology, Linguistics, and Literature.